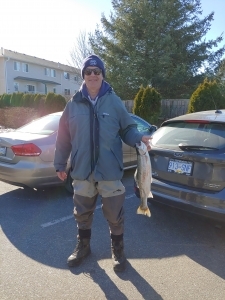 The 2019 Boilermakers Lodge 359 Steelhead Derby was held on Sunday, March 3rd on the Chilliwack/Vedder River. We had 16 participants this year. Registration looked to be down early with only 12 signed up. However, Brother Ross Casselman showed up with 3 friends to participate in the festivities, all of whom had been in a derby on Saturday. Although the fish weren’t fully co-operating that day, everyone who came enjoyed their time on the river while being amongst friends, brothers and sisters. 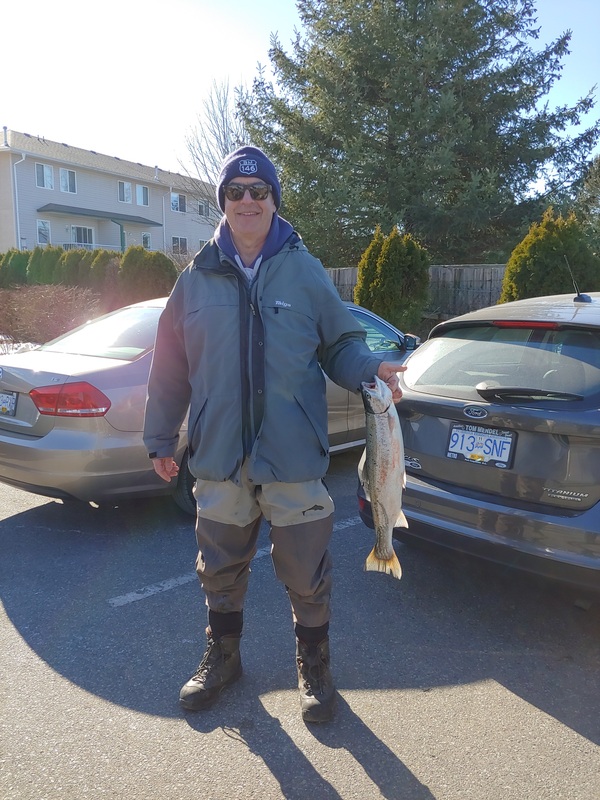 The winner of the 2019 derby was long time participant Ray Rigolo, with a 5lb, 7oz Steelhead. Ray won a prize of $160, half of the entry fees collected, while the other half will be donated to West Coast Boilermakers. We’d like to thank the sponsors, CIMS, Cabela’s and Sea-Run Fly and Tackle for their generous donations that helped make this derby possible. Thank you to Brother Jason Swetlikoff for organizing the event and thank you to all those came out and participated. We hope to see everyone again next year! Just wanted to update the membership that we now offer shipping for apparel orders. 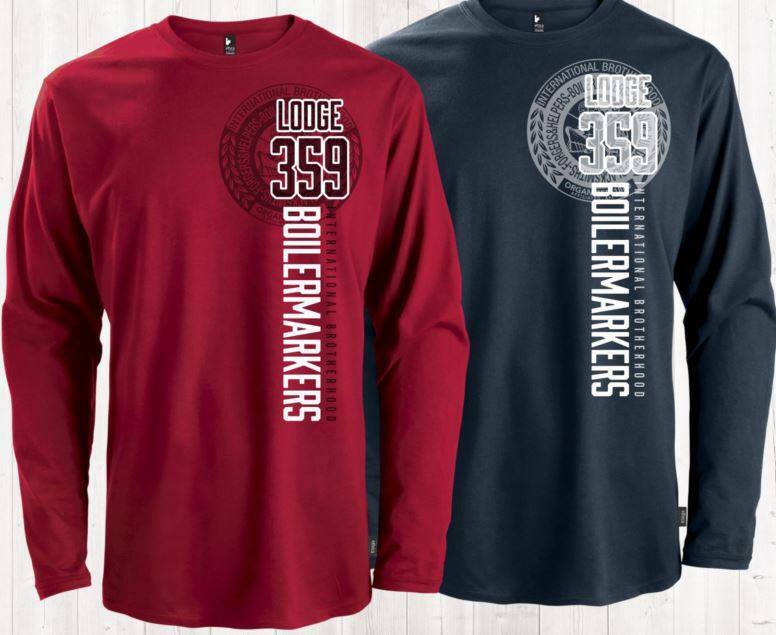 If you wish to place an order, please contact Jamie White at our general office or by email at jwhite@boilermakers359.org. We suggest ordering by email so the phone lines stay open for business calls and it’s easier to track the orders. However if you do have any questions don’t hesitate to call. It will be the MEMBERS responsibility to cover the cost of shipping and a Credit Card will have to be provided for the order to be processed. 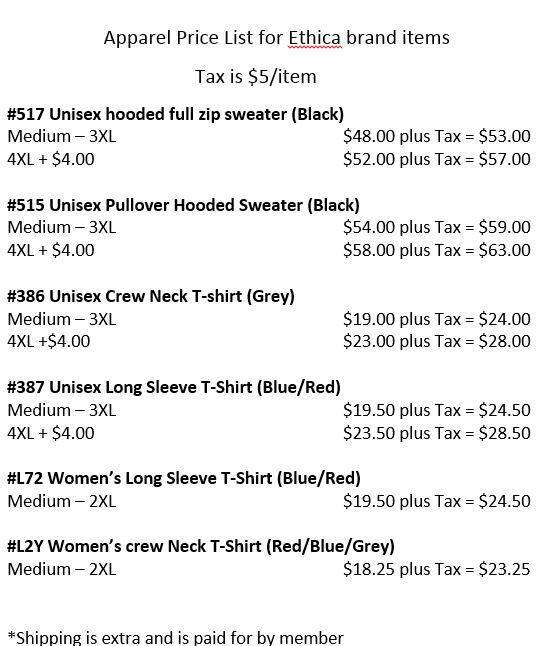 Before any items are shipped, Jamie will contact the member and confirm the total cost for the apparel + shipping. Boilermakers and artists have quite a bit in common says Hilary Peach, a Lodge 359 (Vancouver, British Columbia) member who wields a welding torch as well as a pen. She finds that many artists acquire day jobs in the trades. As an artist who is skilled in several mediums, and as a Boilermaker, she understands why. “Boilermakers are welders and mechanics, fabricators and riggers,” Peach says, noting that likewise, interdisciplinary artists master a variety of different art forms. That’s something that drew her to the union. Peach discovered the Boilermakers after she finished her undergraduate degree in theater and literature at the University of British Columbia. That’s when she realized she needed a parallel career. “If you have an art practice, you learn pretty fast that you’d better get another job to make a living,” Peach says. In addition to traveling out of Local 359 doing pressure welding and other jobs in confined spaces, Peach is a sculptor, poet, filmmaker and writer — her debut poetry book “Bolt” came out in July. She’s also a spoken word performance artist who has graced stages all over the globe. If that’s not enough, Peach has her own blacksmith shop on Gabriola Island in British Columbia, where she lives. In her 12-by-12 shop, she teaches beginning classes in blacksmithing, introducing seven different techniques during a three-hour session. She also uses the shop to complete small repair jobs for the island’s locals. And, she founded the Poetry Gabriola Society in 2000 and launched the Poetry Gabriola Festival — the island’s yearly arts festival. That five-month journey turned into a spoken recording titled “Suitcase Local,” performed with a live band. The recording features four pieces that were named after the different states where she worked. Eventually, she took “Suitcase Local” on tour as a live show. Listen to Hilary Peach’s recordings of her performance art and discover her writings at www.hilarypeach.ca. Peach fits her interdisciplinary art practice around her work as a Boilermaker. After 20 years in the field, she believes her two professions pair well. 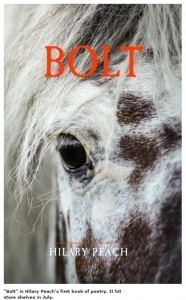 This is one of many poems found in her new book, “Bolt,” published by Anvil Press, available now at www.anvilpress.com. As most of you are aware, the Boilermakers currently employed at the Site C Dam are working under a Special Project Needs Agreement (SPNA) negotiated for the Turbine and Generator project (T&G). This contract was awarded by BC Hydro to Voith Hydro Inc. Fabrication work of the T&G components is being performed on site by a company named Groupe LAR by way of a sub-contract from Voith Hydro. Separate and apart from the T&G work at Site C is another large construction contract, the Generating Station and Spillways Civil Works. Within this scope of work are the Penstocks. BC Hydro has awarded this portion of work to Aecon-Flatiron-Dragados-EBC Partnership. Subsequently the joint venture partnership has awarded a sub-contract to Groupe LAR to construct the Penstocks. Late last year, the Boilermakers held a vote at site in an attempt to certify Groupe LAR. As a part of the process, hearings were held at the Labour Relations Board (LRB) to determine the validity of the vote and to deal with any objections to the certification application. From the beginning of the certification drive the outcome was unclear even though we were certain that members working for Groupe LAR would have voted 100% in favour. As a result of the uncertainty, in December of 2018 the Union engaged in talks with Employer about establishing an agreement similar to the T&G SPNA. We are very pleased to announce that as of January 9, 2019 an agreement for the installation of the Penstocks and all attachments at Site C has been secured, work is set to begin as early as April of this year. In lieu of reaching this agreement the Union has withdrawn the certification application. The new Penstock SPNA is posted on our web page under Membership/Collective Agreements. A little bit of background on this subject. Early in 2018 the Boilermakers were approached by Groupe LAR and offered to sign on to a Poly-Party Collective Agreement signed by three trades, the Labourers, Operators and CMAW. At this time it was a take it or leave offer, with an ultimatum that if we declined then the Penstock work would be given to another affiliate, namely CMAW. This agreement was negotiated without the knowledge or consent of the BCBCBTU, the Bargaining Council. Shortly after this initial meeting the application to have Groupe LAR certified was initiated with a looming fear that the Boilermakers could lose out on this opportunity in its entirety. After discussing a number of concerns with the contractor and hearing theirs, the Boilermakers were successful in resolving our differences through the bargaining process and withdrew the LRB certification application which could have gone either way. Should the Boilermakers have lost the Groupe LAR certification application bid without bargaining an agreement then the Penstock work most certainly would have gone to others including the non-union. Educates employees about the dangers of drug and alcohol abuse. Makes employees aware of counseling and rehab services that are available. Provides access to health insurance and substance abuse treatment. Makes employees aware of the consequences of substance abuse in the workplace. The losses associated with employee drug abuse can include not only missed hours and higher worker’s compensation costs but also higher insurance rates along with damage to our reputation in the industry. Employees who are using drugs and alcohol on a regular basis are more likely to steal from their employers, lie or transfer the blame for their mistakes onto other workers. Giving our members the opportunity to go through a comprehensive rehab program — possibly for the first time — can ultimately save someone’s life. The creation of a drug-free workplace isn’t just about drug testing or having penalties for employees who use drugs. Employers should understand that a substance use disorder is a health condition. This is a condition that can be addressed with treatment, just like any other health issue. It’s not always easy to identify who has a substance use disorder. While some alcoholic workers may take a “liquid lunch” or a drug addict may nod off at his work station, many who abuse substances are high-functioning workers. An employee may never use drugs or alcohol at work. However, he or she may call in sick frequently or display agitated, aggressive or unfocused behavior on the job. There are various other ways you can identify signs of substance abuse other than missing work and being intoxicated on the job. You should keep in mind that some of the signs of substance abuse may indicate that the person has depression, anxiety or another health concern. For this reason, to get to the heart of an issue requires sensitivity, empathy and careful judgment. It can be difficult to seek drug and alcohol rehab, especially for those who refuses to get help. Denial is a hallmark of drug addiction and alcoholism. It may take months or years for a person with a substance abuse problem to admit that they’re chemically dependent. Members who do seek help should be encouraged to use their benefits confidentially and without penalties. Employers must also be firm as well as supportive. As an individual can be held accountable if they don’t seek treatment or continue to use drugs and alcohol. Members should understand that if they refuse to seek treatment there can be serious consequences. An individual who has just completed an addiction treatment program will need support from their fellow members. Education is the first step in helping them stay drug-free. Make it clear to them that resources are available if they need help dealing with a possible substance abuse relapse. If you or someone you know needs overdose prevention or substance use support, please consult your family doctor or dial 811, (a free telephone resource that provides 24/7 non-emergency advice and support offered by the B.C. Ministry of Mental Health and Addictions). Be respectful when speaking about the facts and risks of using substances. Educate yourself so you can answer questions. If you don’t know the answers, offer to look for them together. Look for natural opportunities to discuss substance use and decision-making. Tie-in stories from the news and social media. Talk about why people use substances and the potential consequences and focus on your concerns for their safety rather than what’s right or wrong, good or bad. Be open – Ask questions about what they’re hearing, seeing or have learned. When and Where is The Best Place to Have a Talk? Choose a time when the person is free from distraction and avoid starting the conversation when you are feeling upset, angry or other strong emotions. Choose a place that feels comfortable for the person. Switch off your phone so you won’t be interrupted. Sitting beside or at an angle to the person is sometimes better than sitting directly in front of the person, as it is less confrontational. Some people may find it’s easier to engage in a conversation when they are working together to talk things over. You can start the conversation by inviting the person to talk. Set aside your fear/worry and focus on speaking from your heart that you care about this person (otherwise they might interpret your concern as nagging or lecturing). Listen without judgement or blame or it will shut the conversation down. Work together to create a shared understanding of the risks of using illicit drugs or alcohol. Together, we can help knock down the walls of silence that keep people from talking about substance use and is an important step towards addressing the overdose crisis in British Columbia, especially in the Construction Trades. Recognizing that people who use drugs are real people and helps to put a human face behind the numbers of so many preventable tragedies. This article was written in the memory of the Brothers and Sisters we have lost to this devastating crisis. I wanted to take this opportunity to thank both Ken Noga and Al Dingwall for their years of dedicated and loyal hard work to this Lodge and its membership. As of December 31, 2018, both Ken and Al have departed from their administrative positions with Lodge 359 and have left two very big pairs of shoes to fill. Whether you knew them personally or had an opportunity over the years to get to know either of them, their incredible hard work will be sorely missed. With the vacancies in both Dispatch and a Business Representative position, I wanted to welcome Brother Sat Chatta to the Dispatch and Brother Jeremy Kwok to the Business Representative position. Both of these members have a big task ahead of them in learning just what goes into representing this great Union and its membership, but I am more than confident that both will do so with the upmost respect and diligence. With a new year upon us and new challenges ahead I wanted to remind all members of the importance of keeping your information up to date. Whether this be a change of address or dispatch contact number, safety certifications, beneficiary information or other relevant information, it is crucial that we as members understand the importance of keeping our records current. Over the last few years we have experienced a number of untimely passing’s, and what can lead to further heartache and devastation is not having an up to date beneficiary card or information pertaining to this person on file. If you have moved which many of us do, not receiving mail can become of critical importance when you do not update your home address to both the Boilermakers Lodge 359 as well as our plan administrator at Bilsland Griffiths Benefit Administrators. This is a friendly reminder that a quick call can save a lot of frustration in the future over missed payments or letters etc. 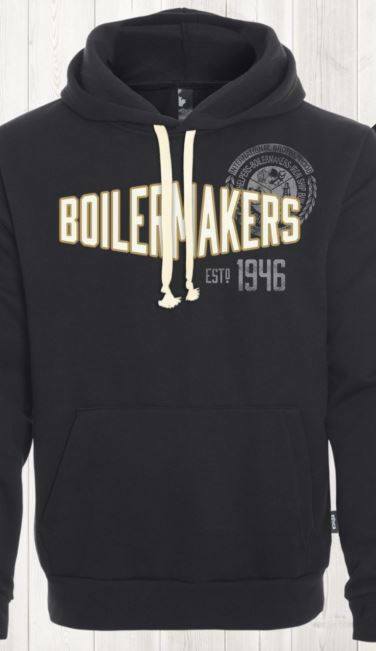 If you are unsure if your information is current, please take the time to check into this by calling either the Boilermakers @ 778-369-3590 or our Administrator @ 1-877-926-4537. A friendly reminder that all inquiries regarding Health and Welfare issues should first be directed to our Plan’s administrator (Bilsland Griffiths Benefit Administrators). If after contacting the administrator, issues remain unresolved then please contact a Union representative for further assistance. The self-pay appeal is a one-time only deal which means it is vital that all members take the time to keep their benefit payments up to date. Benefits can be paid online, under the “Benefits” tab on our website, in person at the administrator’s office or by mail. The membership needs to also understand that even though you may be currently working, remittances made by the contractor to the plan takes time to be submitted and processed. When working outside of the province, remittances can take up to six months before the administrator receives them. In conclusion, whether you are at work or not you should always be aware of your hour bank status. Benefits entitlement is very important to each and every member. The last thing that you would ever want to happen is to be without in a time of need. Job Ready Dispatch – There are still a number of members who have yet to complete the required courses in order to be ‘Job Ready’. This program was implemented last February and became mandatory as of September 2018. If you have not yet completed your job ready training then you are ineligible for dispatch, this includes everyone who works under the terms of the BCA and CLR collective agreements, which includes General Foreperson(s), Foreperson(s), Journey-person(s), Apprentice(s), Travel Cards and Permits. There have been some instances where emails were not received and therefore no certifications were put on file. If you feel that you have sent in your certificates but they are not on your file, please contact the training coordinators office and inquire. Apprentice and Pro-Jo Reports – A friendly reminder that reports (good and bad) are key to the success of our organization. This information enables the Executive Board to render proper decisions when they are presented with concerns about new members. Both Apprentice and Pro-Jo reports can be found on our website and can be completed online or can be printed. Reports are also not limited to Apprentices and Probationary Journeymen. In 2018 the Executive Board received many letters from members from other locals requesting a transfer to Lodge 359. 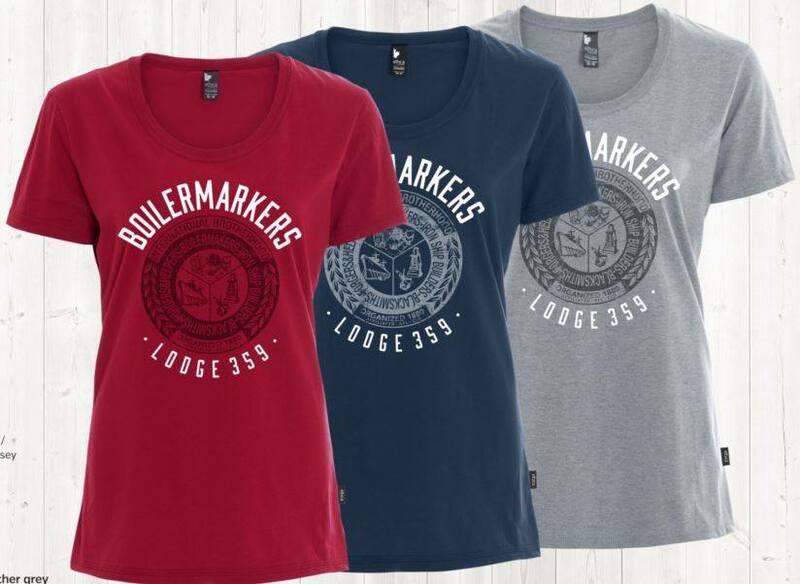 With the anticipation of a work scope that will require skilled Boilermakers for the upcoming years and with an increasing number of members retiring, we may look to expand our membership with transfers from other Local Lodges. This makes it just as important to send in letters on behalf of potential transfer candidates so we have a good understanding of who we may be accepting into our local. The Executive Board would like to note that this is not a squeal service, it is vital that we manage ourselves in a manner that assures we are providing the best possible trades-persons and service to our clients. Dues Reminder – As of January 1, 2019 the International Headquarters issued an increase to monthly dues to the rate of $47.80 per month. It is the sole responsibility of each individual member to keep their dues up to date. Dues can be paid in person or online through your MemberLink account. Members who fall two months in arrears shall be automatically suspended from all rights, privileges, and benefits of the International Brotherhood. 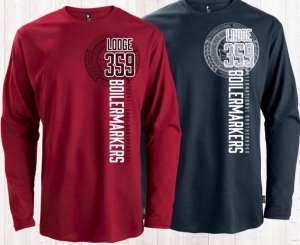 Boilermaker 359 Apparel – New union apparel has been ordered and is expected to be here by the end of January. 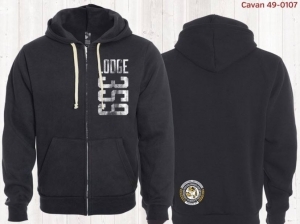 There will be new styles of hoodies, Men’s and women’s t-shirts and long sleeve shirts. 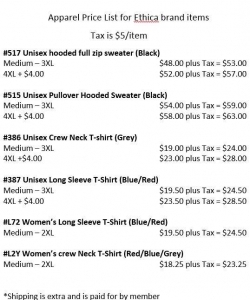 All apparel can be purchased at the Union office. The members of the Executive board would like to wish everyone a Happy, Healthy and Prosperous 2019. 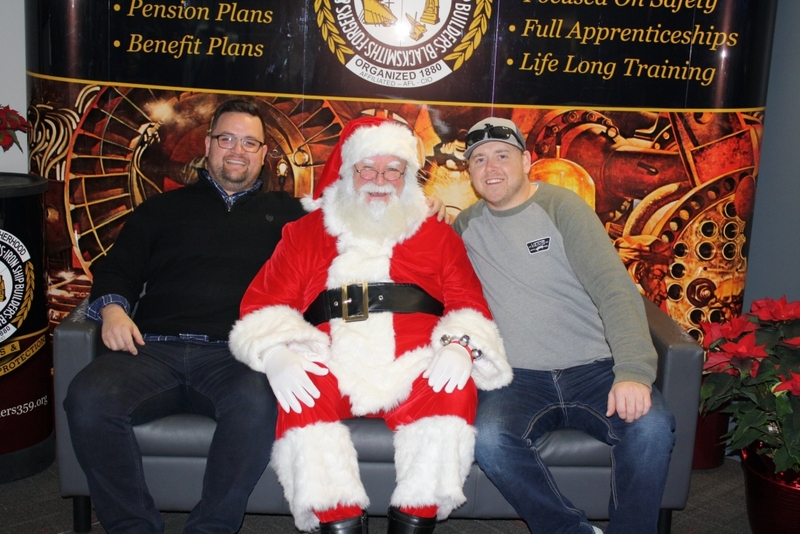 On December 8th, Boilermakers Lodge 359 held the annual Kids Christmas party. A Star Events Team painted faces and made balloon animals. The children had a blast while decorating their own gingerbread people, collecting candy from the Piñata and munching on the tasty food brought by Picnic in the Park Catering. The smiles on everyone’s face grew even larger when Santa made an appearance bringing his jolly spirit and gifts for all the children. A big thank you to the membership for approving the necessary funds to hold this special event and to those who helped plan and organize such a great day. Please clink on the link (https://www.facebook.com/pg/Boilermakers359/photos/?tab=album&album_id=2392370067446470) to see all of the photos from the party, we look forward to seeing everyone again next year! BM&M Screening Solutions (previously Burnaby Mill and Machine) was just recently sold by its long time owners, Peter and Dave Humphries, to Hillenbrand Inc. Hillenbrand is a large publicly traded company that owns similar businesses and is based in the USA. BM&M has been a unionized Boilermaker Shop for around forty years and we look forward to working with the new ownership long into the future. Peerless is very busy and looking for new employees, particularly production welders. If you know of any welders, especially entry level welders, looking to live and work in Penticton you can tell them to send us their resume and we will forward it along to Peerless. IST Boiler was bought out of receivership this past summer, and then went into full production mode supplying tube platens for the Northwood boiler job that progressed into a major wall replacement. 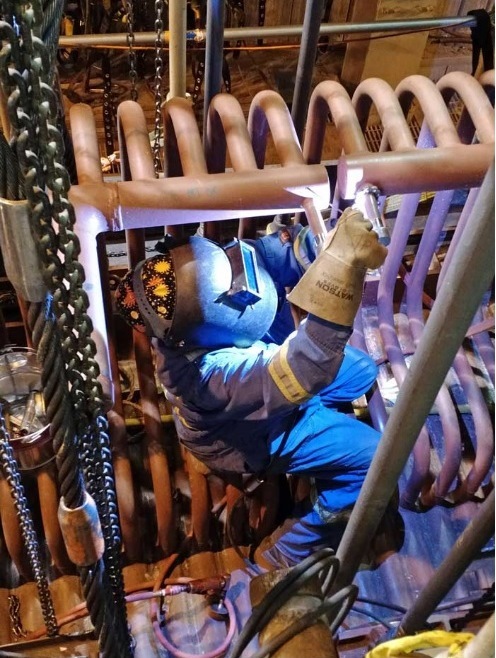 We have heard from multiple sources that the quality of work on the supplied parts was exceptional, and we would like to give a shout out to our members at IST Boiler for the time and effort put in under tight timelines and with evolving specifications. It was much appreciated at the jobsite too. It was a busy year for the QCCC membership in BC, and looks to be busy again in 2019. There were quite a few new members brought in to the Pacific Region over the year, especially in the shipyards. If you are working alongside a new member, or a probationary member, it’s a good chance to discuss the importance of our Union in the province and the benefits that working Union can provide. Although there is a push through our National Training Society for an “apprenticeship” type program for QCCC, it’s a long road and we’re not there yet. It can be daunting for entry level workers, especially the younger ones, to understand what’s required to move up in the NDT industry and make it a career. This includes things like what’s available to them for training and how to get it, and what substantial benefits and pension packages can do for them over a long career. This is where mentorship by our experienced membership is invaluable. Please take the time to engage and involve the new faces you see out there, and pass along your knowledge and experience to those coming up behind you. Of course, if anyone has any questions please don’t hesitate to call your Pacific Region Reps. The Boilermakers annual Christmas meeting was held December 5th at the Cascades Casino in Langley. During the Christmas meeting the annual Cody Brothers Bursary was awarded. Brother Rick Cody on behalf of his brothers presented Dustin Cable with a cheque for $400.00 in recognition of his commitment and hard work during his apprenticeship. Horton CBI weld testing took place at the Boilermaker Training Centre during the month of November. Members were tested for the Pembina Spherical tanks in Prince Rupert. We have the weld procedure for anyone wishing to practice or review. Sheldon is available for anyone wishing to practice or upgrade on most Mondays and Tuesdays. A combination Aerial boom and Scissor Lift course was held November 29 with twelve members receiving certification on both Scissor Lift and Aerial Boom Lift. Boilermaker Level 03 is being held from November 19 through December. 21 at BCIT. 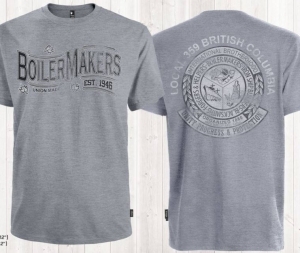 Boilermaker Level 02 is being held from January 7 through February. 8 at BCIT. Boilermaker Level 04 will be held January 7 through January 18 at the Joe Kiwior/Ivan Shook Training Centre. The 2018 Apprentice Awards Banquet was held late last year in Ottawa on September 5. The 2018 top student that attended the tripartite conference and Apprentice Banquet was Collin Robertson. Collin represented Lodge 359 as the top apprentice for 2018. A two day Job Steward training course will held January 29 and January 30 at the Boilermaker Training Centre for members only. To register you can call the general office at 778-369-3590. Happy New Year to the members of 359. With the New Year upon us I would encourage the members to make sure their dues are up to date, Job Ready Dispatch certificates have been uploaded into the union’s database and dispatch phone number is correct. Although January is traditionally a slow time of the year we do have some jobs that will be going forward. Lafarge should be kicking off the year with a shutdown in their Cement Plant starting January 14, 2019. Followed by another shutdown in early February. Lafarge has not released any manpower or duration estimates at this time. There will also be a small crew of four Boilermakers going to John Hart Dam to perform demolition work on the existing penstock, surge tower and power house. Keep in mind, this job does have a local hire provision. CIMS will be working at Parkland (Chevron) in the Poly/Penex unit starting February 4, 2019. This shutdown will last approximately 2 weeks with a crew of fifty Boilermakers. These fifty Boilermakers will be in addition to the maintenance crew. CIMS will also be going into Covanta early March for a small Boiler Shutdown. This will lead us right into the regular spring shutdown season. Group Lar is the contractor at Site C, we currently have a small crew of six Boilermakers there. They should be bumping up the crew in the coming weeks, exact manpower numbers have not been determined as of yet. The SPNA has been uploaded to the Boilermaker 359 website, members are encouraged to have a read. Horton is building 3 Spherical Tanks in Prince Rupert we currently have twenty Boilermakers on site and should be doubling the size of the crew at peak production. This jobs offers flights from 6 major hubs Vancouver, Victoria, Nanaimo, Prince George, Kelowna and Kamloops. The enabled agreement https://www.boilermakers359.org/wp-content/uploads/2018_02_26Enabling_Signed.pdf has been uploaded to the Boilermaker 359 website, members are encouraged to have a read. Local 191 Victoria Shipyard are anticipating a busy year. They will be looking for travel cards late January. Local 128 will also be looking for travel starting March, they will have two major shutdowns in Sarnia and Nanticoke as well the ongoing work at the Nuclear Plants. Be advised that nuclear clearance does take four to six weeks. Also the province of Ontario requires everyone to complete an online WHMIS 15 course. Working at heights and Confined Space courses that are specific to that province, OSSA tickets will not be accepted. These courses are held at the Burlington office and can be completed in one day. Please call the Local Lodge 128 office and arrange for these courses prior to heading out to Ontario, as they are mandatory. We will be reaching out to our contractors in order to come up with a 2019 Rumour List for the members. Keep in mind it is only a Rumour List!! 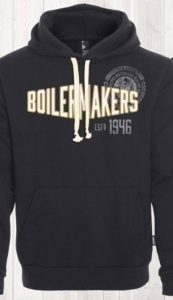 Please be advised that the Boilermaker scholarships notification letter complete with detailed instructions has been posted on the Membership Services page.